When approaching the cathedral it looks somewhat unassuming when compared to what awaits you inside. If you are visiting Europe for the first time from North America nothing can prepare you for the detailed beauty of the architecture, you will be left in awe of the size and beauty. Despite the Cathedral of the Incarnation living in the shadow of its more famous sister, the spectacular Alhambra, it should not be overlooked. You don’t need to have any particular religious beliefs to appreciate what you’ll see inside the cathedral. Inside the cathedral is the main, cavernous aisle, lined with enormous carved columns. You must remember to look up, for this is where you’ll some of the painstakingly created decorations. One can only imagine the skill and time it took to create these intricate details in a time when power tools and other modern equipment wasn’t available. Stand at the back of the cathedral, looking down the patterned floor that draws your eye to the main alter for a shot that captures just how amazing the place is. Next, walk toward the front, slowly soaking in the grandeur and planning your next shot ¨C the golden dome and alter. The light here is glows, bringing a warmth to the massive space, almost as if the sun is shining inside. A wide angle lens is perfect for getting the magic of the golden dome, rimmed with arched stained glass windows and paintings. The dome’s ceiling is is painted sky blue, adorned with gold stars. Every inch of the dome reveals more beauty. Move around and take it in from different angels and more shots than you could imagine will come into view. 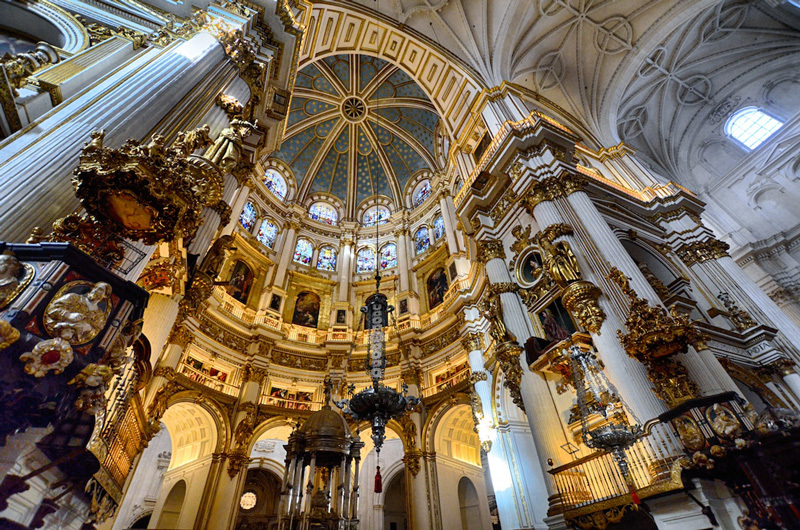 Every angle of the cathedral offers the viewer another chance for creative composures. The symmetry is perfect, both on a large and tiny scale. Look up for the golden organ, lit beneath giving it an ethereal glow. Take your time and zoom in on areas of the golden shrine. The detail here is worthy of a close-up study. You will leave the cathedral feeling inspired.